Cooper is out of our GCH Harborview Under Construction OS x Carova’s Rolled Into Steadmors Helping Hands RN CGC . 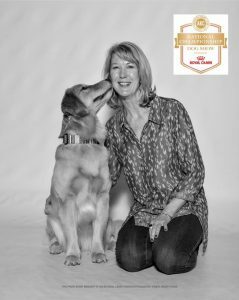 Cooper made the first cut out of 32 competing in Am Bred Class at the 2017 Golden Retriever Club National Specialty. 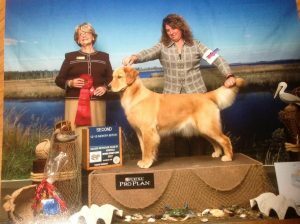 She looked beautiful with her handler Kristin Lyons. Cooper later moved to SC where she is now being handled by Amy Walker. Cooper will take a break from showing to become a mom. She will return to the ring to finish her championship after motherhood duties are fulfilled. 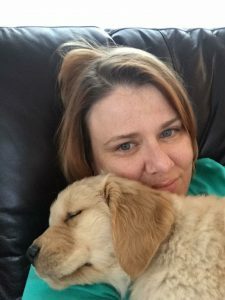 Cooper is loved to the moon and back by Vicky Shields. Cooper is part of our breeding program and when the time is right, will carry on for Gabby. Molly picks up a major. Molly is out of GCH Harborview Under Construction OS x Carova’s Rolled Into Steadmors Helping Hands RN CGC . Molly took some time off to become a mom and will hit the road in a few months to finish her championship. In addition to Molly doing AKC shows, Marilee is enjoying showing her girl in the UKC venue. Molly is owned by Jason and Marilee Glover. 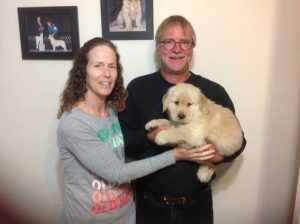 Skye is owned and loved by Billy and Karen Foote. 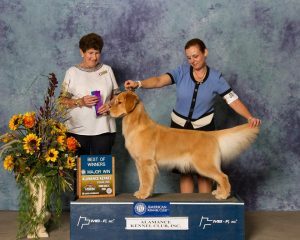 They are new to showing and once realized that show dogs are just our pets before anything else, dove into the show dog world. Skye is a part of our breeding program and just had a lovely litter. She will return to showing after her motherly duties are finished. Skye is a repeat breeding in 2017 of GCH Harborview Under Construction OS x Carova’s Rolled Into Steadmors Helping Hands RN CGC. 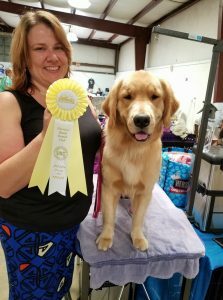 Skye started her journey with a bang by going Best of Opposite Puppy in Sweeps at the Gunpowder River Golden Retriever Club Specilaty ( 04-21-2017). Her owners had no idea how big of a deal this placement was. Even the judge, Sandra L. Novocin, had to point out to Karen what an accomplishment this was for a young puppy ( 6-9 months class) A very fun day and experience for the show dog newbies. 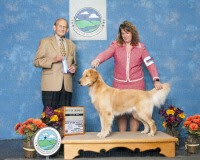 Karen showed her own dog, (first time in the ring) and achieved success. Skye is also working on her obedience titles and is a very easy dog to train. Kristin Lyons with Skye at the 2017 GRCA National. Skye was 2nd place out of a very big puppy class ! News ! 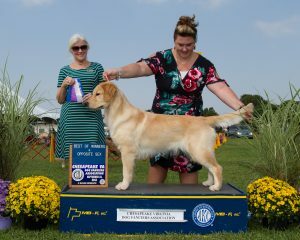 On September 27th,at the 2017 Golden Retriever Club Of America National Specialty she shined yet again. Skye placed 2nd out of 28 puppies in her 12-15 month puppy class! This was incredible ! This time, her owners were very much aware of the bragging rights with this placement. Kristin Lyons made it look effortless and we thank her with all of our heart. The sky is the limit for this outstanding puppy, and 2018 is going to be fun ! 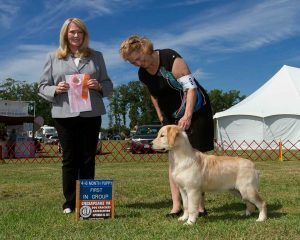 In 2016 Titania did a puppy match at Chesapeake Va and earned Best Puppy. One year later, Titania went WB at the Chesapeake Show. Paisley is loved and owned by Deborah Miller. I think Paisley has more travel miles than I do. She loves traveling with Deb and has started her show career off with a bang. Best In Show Puppy! Chloe is owned and loved by the entire Broadbent Family from VA. They too came to a show to “watch” and cheer on some Carova babies and within an hour looked at another family and said,” I think I want to do this. It is not what I thought it was at all. The dogs are having a great time and the atmosphere is laid back”. 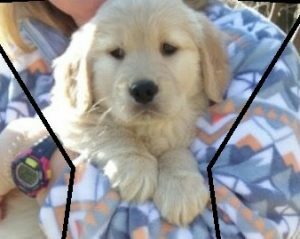 Spencer went home and chatted with the family that all agreed, we will have a show puppy if she grows out nicely. So excited for adventures ahead. Bonnie is owned and loved by the East Family . Although , the East Family is BIG into obedience, they appreciated that her structure is lovely and are happy to let her show. Going to enjoy all the adventures with this girl .